At Bacopa Bay, an abundance of glass, balconies, terraces and verandahs help erase the boundaries between indoors and out, inviting a breathtaking view of Boca Ciega Bay into each home. 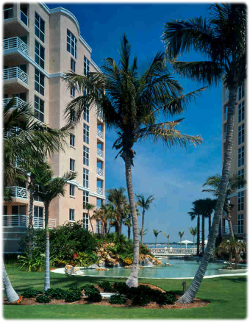 Built in the manner of a formal Bermuda estate, the first of five mid-rise condominium buildings was completed in January 1996, with the entire community of 192 homes - coming to life in 1998. Many original residents still delight in this exciting community as if every day were move-in day.